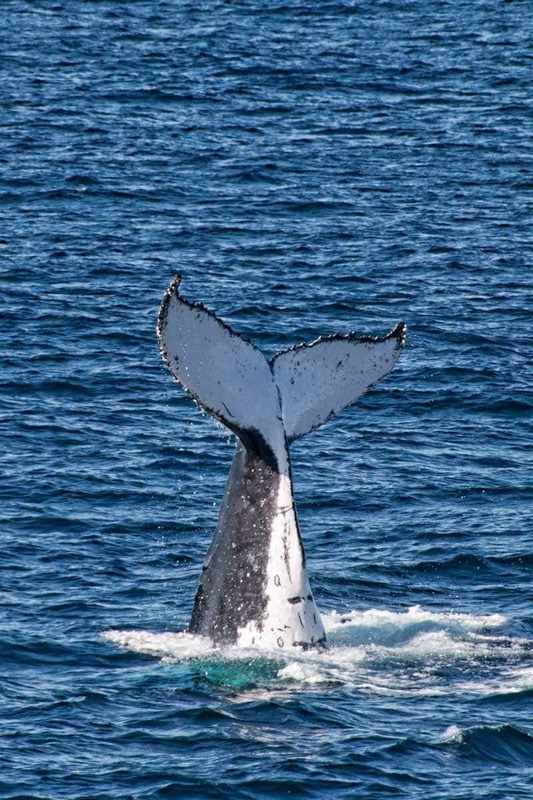 Did you know you could go whale watching from Brisbane? 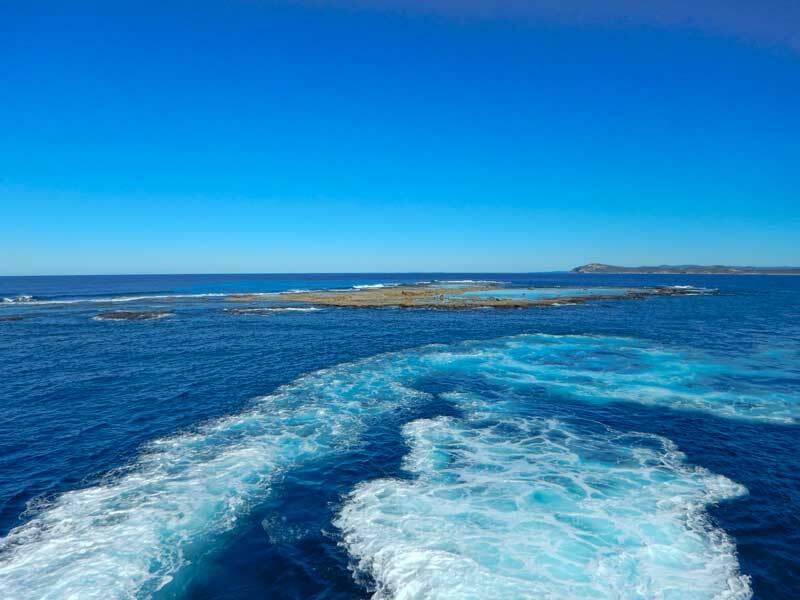 See magnificent humpback whales, dolphins and dugongs just a short boat away off Morton Island. The river is such a dominant part of Brisbane life that many visitors to the city don’t immediately think of spending a day out on Moreton Bay. The bay and islands off the coast are a beautiful part of this capital city and are home to a diverse variety of sea life. Dolphins, dugong and turtles live here all year round but did you know you could go whale watching from Brisbane? 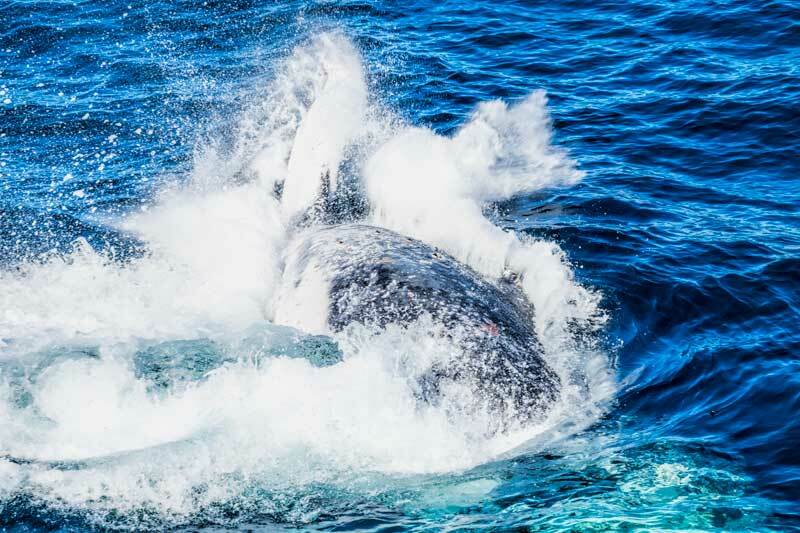 For 6 months each year the huge humpback whales are in the area as part of their annual migration. Only 5 km north west of Moreton Island you’ll also find Flinders Reef, with more coral species on a single reef than any other on Australia’s east coast including the Great Barrier Reef. 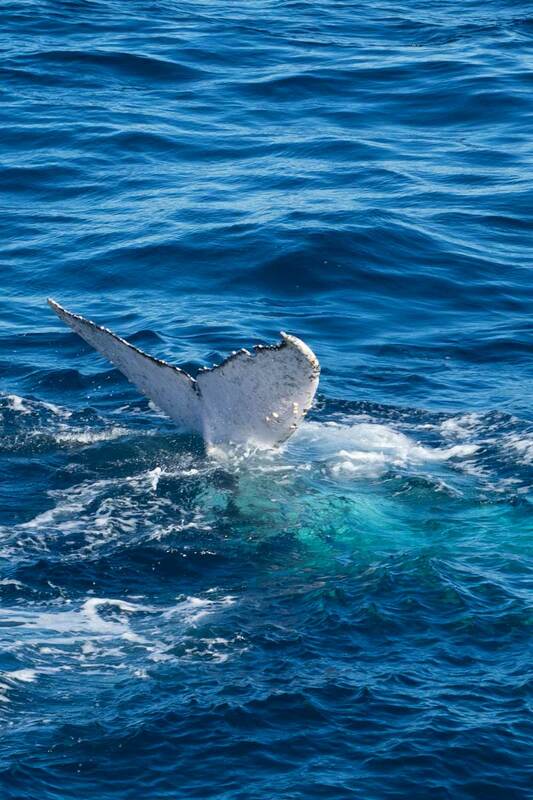 We recently spent a day off the coast of Moreton Bay with Tangalooma whale watching. Any day out on the water is a good day in our view but seeing the whales from a Brisbane base had a couple of benefits; it’s convenient to get to, the whales are in Australian waters during winter when Brisbanes weather is fairly predictable and mild, and the whales tend to travel up nice and close to North Stradbroke and Moreton Islands so you don’t have a long trip out which means much more of your cruise can be spent with the whales not looking for them. 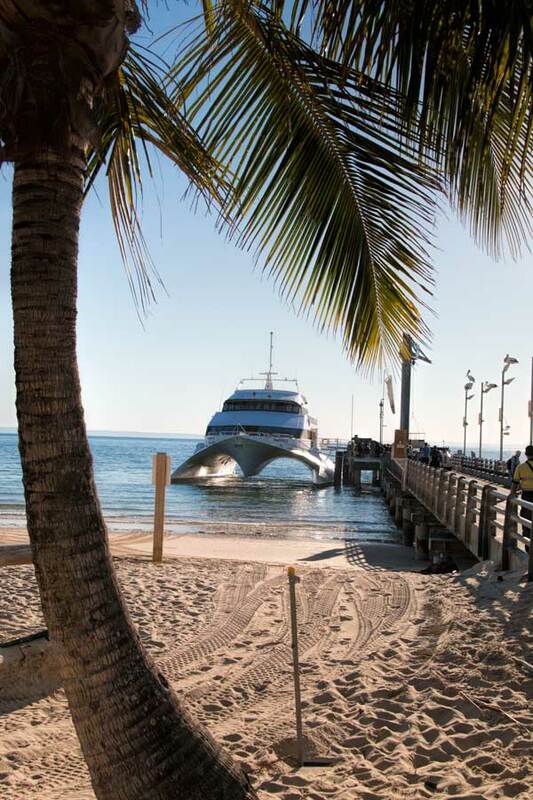 The day starts with a cruise out to Tangalooma Island Resort, the starting point for the whale watching part of the day. We’ve spent a lot of time on the river over the years but had never traveled west out to the bay. There’s no bar to cross at the river mouth so it was calm sailing all the way. We headed up to the top deck and got great views of the port, prawn trawlers and a number of the larger sea birds flying overhead including osprey, brahminy kites and plenty of pelicans. Once you arrive on the island you don’t spend long at the resort before jumping back on the boat and heading out on the whale watching cruise. It’s just long enough to get down onto the beach and get a bit of sand between your toes, who can resist that. The cruise gives a good view of the island as you travel out and back. The eco ranger on the boat provides a commentary that explains its attractions and a bit of history of the area. Later he gave information on sea life and whales, the behaviour they’re exhibiting and where to look from the boat for the best view. Our eco ranger was Corey and he was excellent, later on the trip back he walked around the boat talking to everyone and answering any extra questions they had about the whales and the area. The wrecks are fairly close to the resort so you’re able to walk or kayak down to them. They’re a very popular spot for snorkeling either off the beach if you’re a confident swimmer or you can do a cruise and snorkeling trip. We saw them in the distance as we headed out whale watching but we got a bonus on the way back when the captain took us in on the beach side of them so we got a spectacular view from the top deck. I’m not sure if that was standard or not but we weren’t expecting to get the chance to see them up close this visit. We definitely want to kayak out around there next time. There are green sea turtles regularly seen around the wrecks so everyone had their eyes peeled. There were 4 spotted from the boat this trip but not by me. Another snorkeling spot pointed out to us is the Curtin artificial reef although that one is fully below the surface so you need to know where you’re going or look for all the little boats fishing. It’s another one you can swim out to from the shore if you’re fit enough. For the divers though Flinders Reef is where you want to be and you’ll need a boat or dive trip for that one. 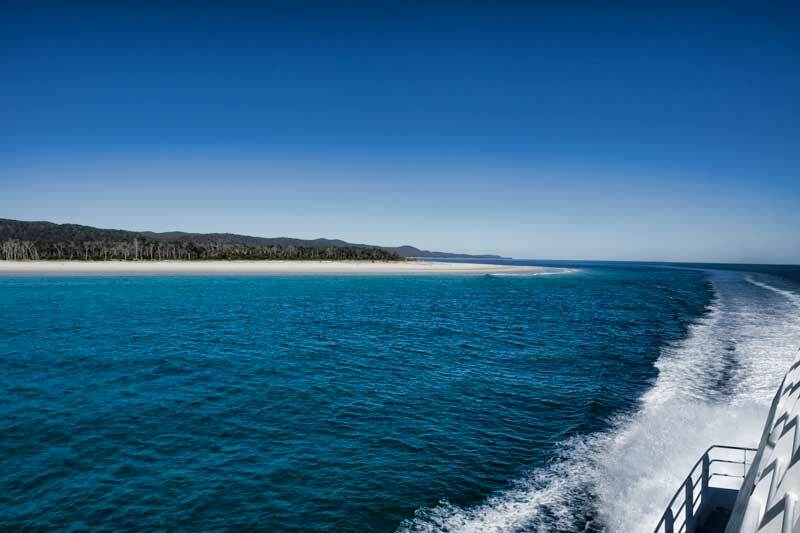 It’s about 5 km north west of Moreton Island and we took a good look around on the whale cruise. It’s incredible that more people haven’t heard of it with it being so close to Brisbane and relatively easy to access. It has the most coral species of any subtropical reef along Australia’s east coast and that includes the 2900 odd reefs that make up the Great Barrier reef system. During the cooler months the southern hemisphere humpback whale populations make a migration north. One of these populations, known as Group V now includes around 20,000 whales. 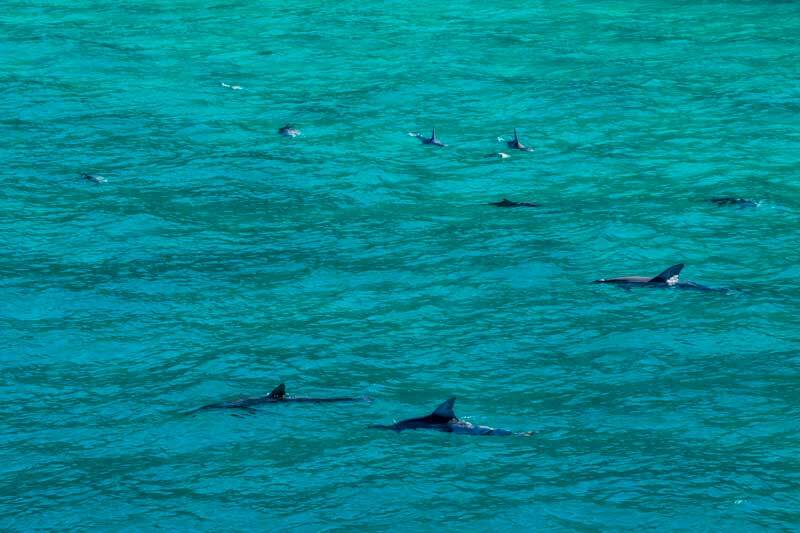 They complete their annual migration up the east coast of Australia from their winter feeding grounds in the Antarctic region to their northern breeding grounds inside the Great Barrier Reef of Queensland Australia. Timing varies a little by year but usually you’ll see them headed north from June to August and south from August to November. 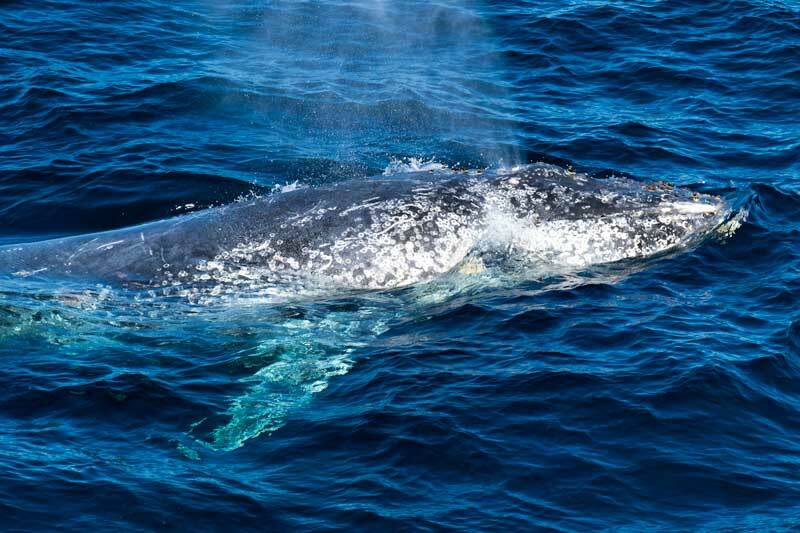 In the waters off Moreton Island the whales are over half way through their journey which averages around 5,000 km but can be up to twice that. Although they’re intent on their migration they do interact with each other and show some interest in approaching the boat. There’s plenty of spouts spotted in the distance before we’d even made it out from the shelter of the inland side of the island. The first highlight of the day for us though is spotting a dugong on the surface closer in to the shore. It’s our first wild dugong sighting and a big tick on my Australian wildlife wish list. The sea grass beds of Moreton Bay are a popular spot for them and although still listed as vulnerable it’s now estimated that there are around 1000 living in the bay. The cruise out along side the island really made us wish we had more time to spend exploring, it really is a beautiful and remote for a spot so close to a major city. Land was soon forgotten though as the whale spouts were spotted in the distance and we headed out closer. At times the boat cruises along parallel to the moving whales, at other times it stops for us to watch them. We spent a bit longer being entertained by the whales including two juvenile males travelling together who could have made the Olympic team with their synchronized swimming and diving. 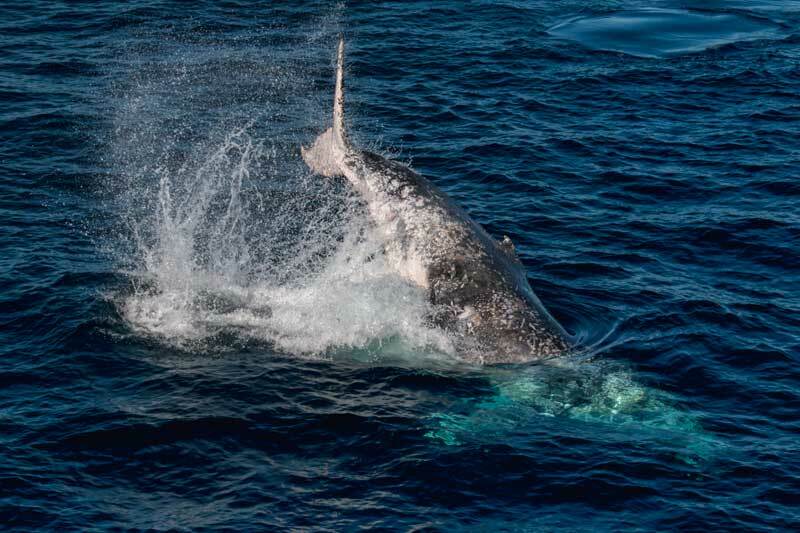 There were also a good number of breaches and huge splashes from some of the bigger whales as they body slammed back into the water. Then there was this one below who seemed to wave goodbye just before it was time for us to head back to shore. The trip back took in some more of the gorgeous coastline and the Cape Moreton lighthouse, the oldest lighthouse in Queensland. Then we were joined by these guys, honestly there would have been at least 3o dolphins all around us, probably way more than that but I wasn’t thinking too much about counting them with this great spectacle and I couldn’t drag myself away from watching them to go and swap out to a wider angle lens. It was the perfect precursor to the next highlight of the day – the possibility of feeding a wild dolphin from the beach at dusk. We returned to the resort just after 3 pm which gave us a couple of hours to take a look around. As day guests you’re able to use all the facilities including the pool, restaurants and bars. The sun sets pretty early in winter in Queensland so once the shadows got a bit too long for photography we settled ourselves at a table in the beach bar area with a drink and hot snack. 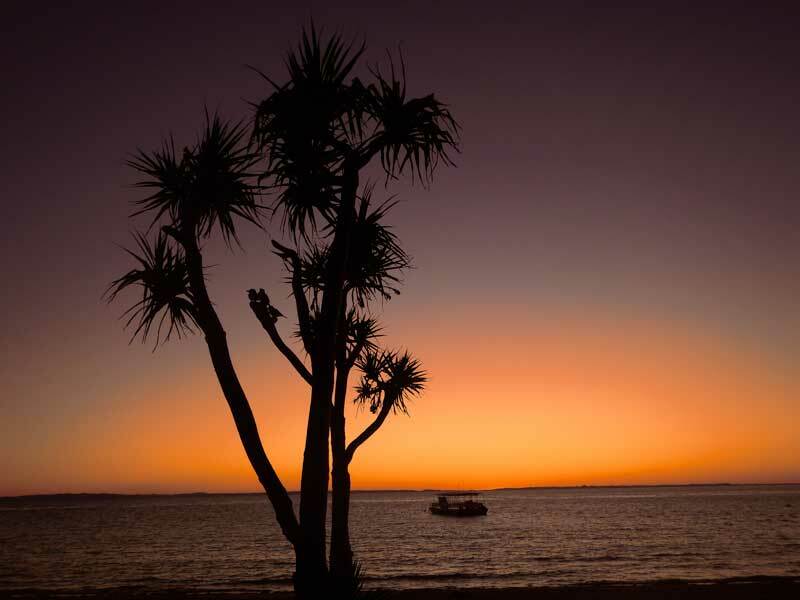 It’s the perfect spot to watch the sun go down over Moreton Bay. Although we were only visiting for the day we were booked on the late ferry home so we could take part in the wild dolphin feeding off the beach. I’d heard about it many times and there was no way that being the middle of winter would keep me out of the water. The sea temperature doesn’t change much throughout the year so at the moment it’s actually warmer in the water than out of it at night so you really don’t feel that cold. Plus the excitement of hand feeding a fish to a wild dolphin, I mean when will you ever get the chance to do that again. 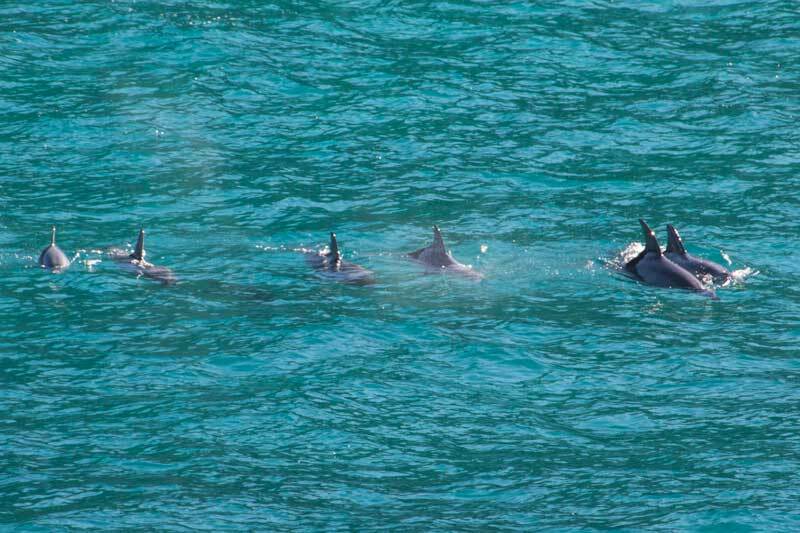 These dolphins are genuinely wild and freely choose each evening whether they will come into the beach for that nights feeding. I was a little over excited so I sat on the jetty watching from just after 5 o’clock just in case one arrived early. By 6 pm I was getting a little concerned but 2 male dolphins made their way in to the jetty area and over the next 15 minutes several others arrived to get their share. If you have an interest as we do in the welfare of wildlife you might be wondering how this works. In Queensland it’s law that you must stay 50 metres away from dolphins, if they approach you as they do sometimes with surfers and kayakers that’s fine but you mustn’t attempt to touch or feed them. 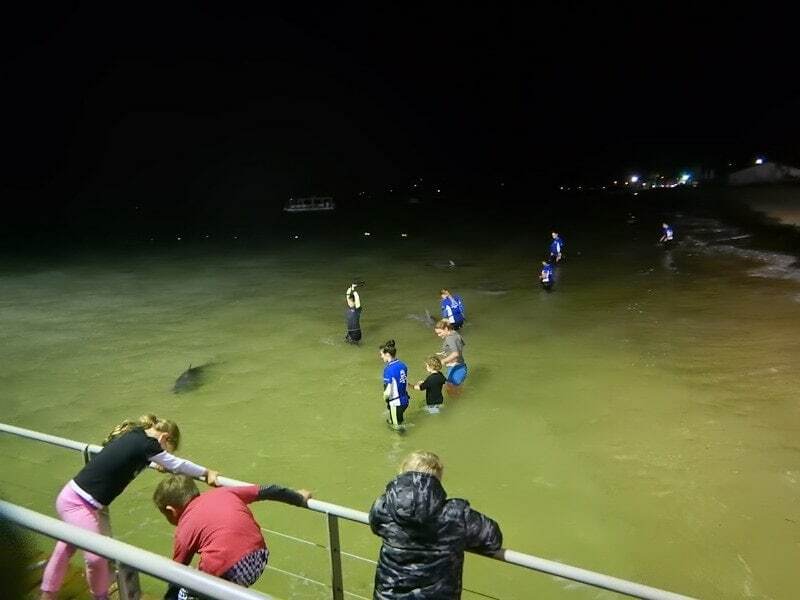 Tangalooma Island Resort has had their dolphin care protocols approved and been granted a permit allowing the night feeding programme so it’s one of the few places where you can get up this close to wild dolphins and be able to offer them a fish. The welfare of the dolphins is top priority. You have to clean you hands first in antibacterial wash before picking up the fish, then hold the fish firmly and place your arm deeply into the water for the dolphin to take it at a natural angle without lifting it’s head above the water which can be harmful. They’re also only fed around 20% of their daily diet so they don’t become dependent on the resort feeding. You can take a photo but you can’t use a flash and of course don’t attempt to touch the dolphin. 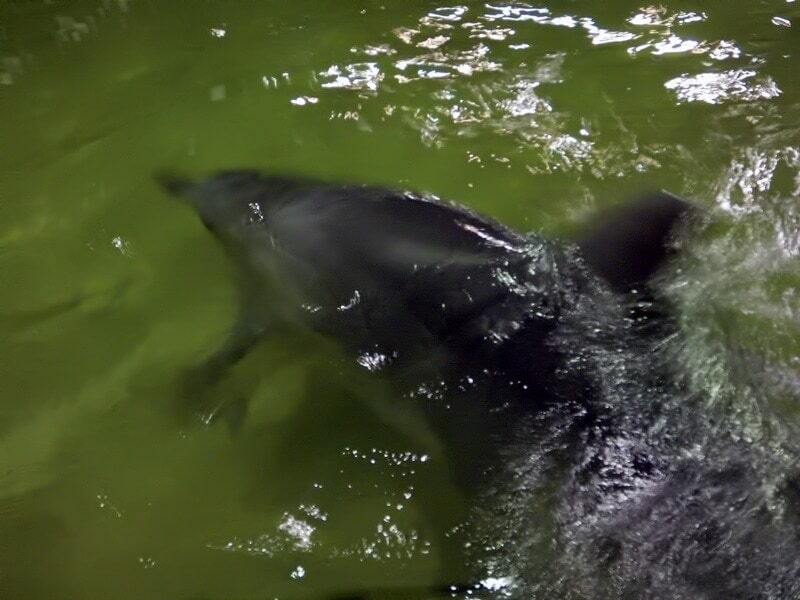 Which dolphins will arrive each night is a matter of chance but I was super excited to find that we’d be feeding Nari. At 19 years old Nari is one of the older boys to visit and he’s a bit of a local legend. Back in 2009 Nari had a horrible run in with a shark and suffered an infected wound to his head. Having been a regular at Tangalooma since he was young he was able to be captured and treated by the Sea World team and nursed back to full health down on the Gold Coast. A couple of months later he was well enough to return to his dolphin and human family at Tangalooma where he has continued to visit most days with his good mate Echo. It was such a pleasure to get to feed Nari and spend a few minutes in the water with him. Dolphins belong to a group of whales known as odontoceti, that means they have teeth. You’re holding that tiny fish very close to those teeth but he takes it gently then hangs around a bit to be social before swimming around at the waters edge and deciding if he wants to be fed any more today. If you’re staying to feed the dolphins on a day trip try to end up near the front of the queue. Despite being first on the jetty I somehow ended up at the very back of the queue to feed which meant it was a mad dash to dry off and put warm clothes back on so we didn’t miss the last boat back to Brisbane for the day. It’s was a full and very enjoyable day. If you love getting up close with wildlife and you’re spending some time in South East Queensland over winter this is a great trip to consider. 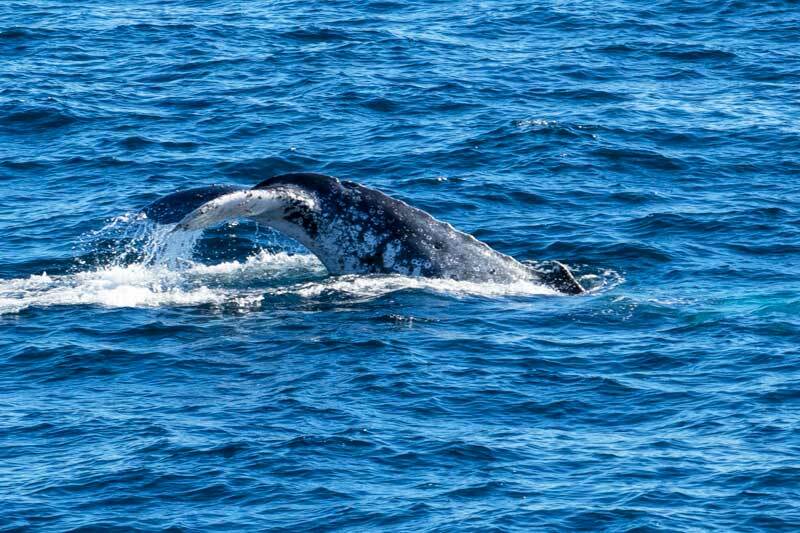 The Tangalooma whale watching trips off Moreton Island run from June to October. 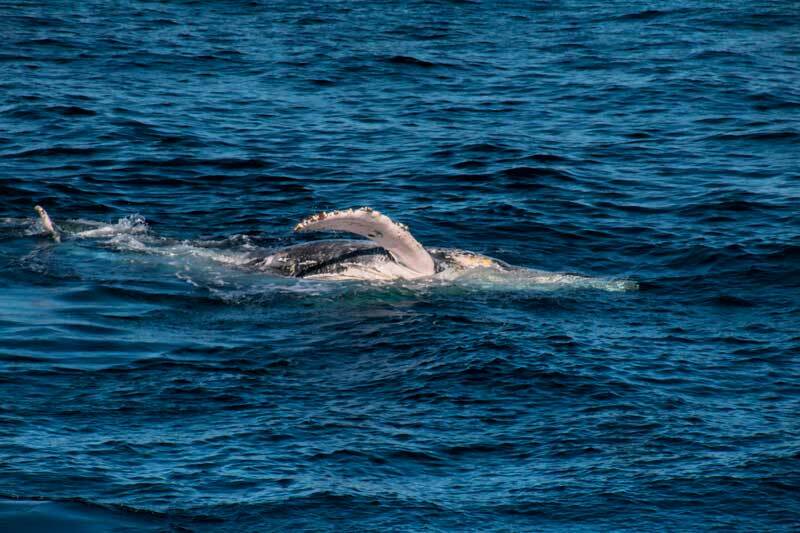 This means you have the opportunity to see the whales on either the northern or southern phases of their migration. The catamaran leaves the Holt Street wharf in Pinkenba at 10 am. If you are driving make sure you allow enough time as you’ll need to join the queue to exchange your e-tickets and buy a parking token before moving your car to the parking area. The boat boards about 15 minutes before departure. 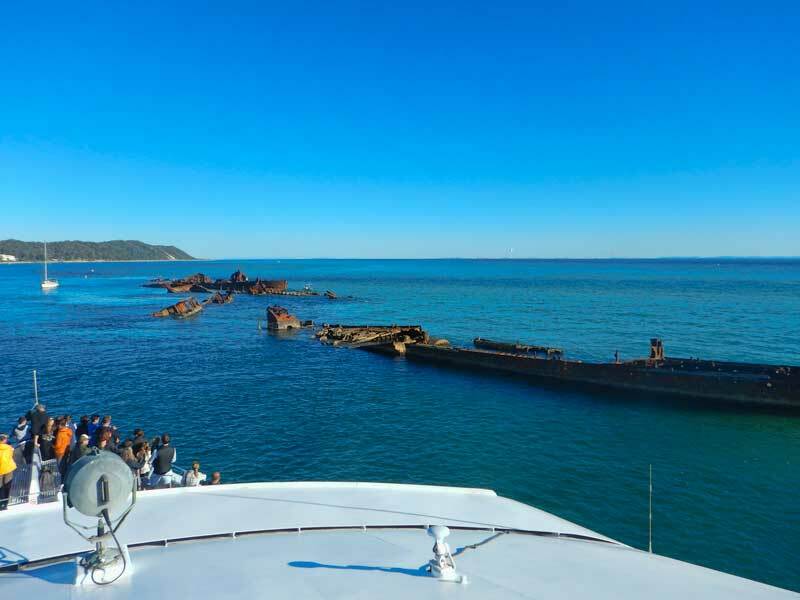 Of course if you’re fortunate enough to be already staying on Moreton Island you can join the cruise from the Tangalooma jetty at 12 noon. 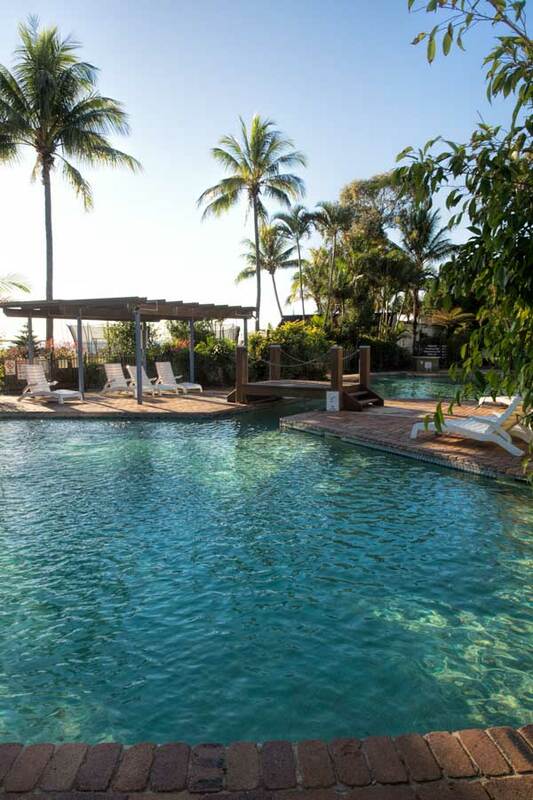 You can book tickets online for the whale watching and dolphin feeding experience, accommodation and other adventures at the Tangalooma Island Resort booking page. Any time you’re spending the day outdoors on the water it pays to remember your sunscreen and hat. The breeze can feel a bit cooler out there so some warm layers are a good idea and if you’re going to feed the dolphins take a towel and a change of clothes, the depth of water you need to get into varies with the tide and other conditions. We attended the Tangalooma whale watching and wild dolphin feeding experience as guests of Tangalooma Island Resort. As always the article reflects our honest opinions and personal experience. Moreton Island is such hidden jewell which is so accessible from Brisbane. I have spent many times camping and holidaying here over the years. Your whale photos are incredible. I would love to visit here again soon. Camping over there or Straddie would be great Kathy, we are lucky to have such beautiful and remote feeling places so close to our cities. Awesome! I’ll have to keep whale watching in mind when we make it around there. We recently drove across the Nullarbor and stopped by the Head of Bight where there were nearly 70 Southern Right Whales hanging around there. Including a bunch of calves with their mums. It was a pretty humbling experience and the first time we’d seen whales in person. Thanks for sharing your experience Toni. We’d definitely try to see them if we were down there at the right time of year, we tend to stay north in winter 🙂 Did you do the helicopter or a boat trip Jen? Nari’s story is incredible! So cool that you got to feed him and see so many dolphins and whales during your trip. I went whale watching in South Africa but we didn’t see nearly as many whales. What a great experience! I’ve wanted to go whale watching since I was little, but I always hesitate about going cause I’m afraid of the crushing disappointment I’d feel if I had an unsuccessful adventure. I’m glad you got to see them though! And it’s nice to hear about a place that actually makes animal welfare a priority. Can never be too careful when it comes to wildlife these days. This looks like a fantastic experience. I am happy you were able to see such a diverse array of wildlife! It is also nice to hear that Nari is doing well after his release back into the wild. Yeah Nari is a legend, it was so good to see him well and part of his pod again. Also an example of the excellent work done by Seaworld in animal rescue and recovery they are much more than a theme park. Beautiful photos Toni! We visited Moreton Bay recently, though it wasn’t season for whale watching so would love to get back. We visited from the Gold Coast actually – was a REALLY long day, but definitely well worth the trip! I think we are just so used to driving distance now we’re living in Queensland, in NZ everything was so close together. We do the road between here and the Gold Coast at least a few times a month and just as often the other direction to the Sunshine Coast. Woowww… What a magnificent experience!! The coast is beautiful, the whales and dolphins amazing… I love the idea of paddling a kayak till the shipwreck and watch the sea turtles… A side of Brisbane I didn’t know about it! What amazing whale photos, what an experience! I’ve never heard of being able to snorkel a wreck from the beach before either, I’m always jealous of the divers who get to do that so this sounds perfect for those of us who can only snorkel. It’s on the list, thanks for the heads up! Wow. Amazing tail shots of the whales! I’ve been whale watching in 3 different countries but not with much success – only saw a small one. Always great to see and interact with dolphins! Quite curious about those wrecks. Would love to explore them. How disappointing to not see the whales, you need to come to Australia’s east coast. We’ve have 4/4 excellent trips over the years and most companies give you a free return trip if you are really unlucky and don’t see them although I’ve not met anyone who missed out. Thanks Claire, we absolutely recommend it! These are great photos! I love the ones of the whales breeching. That is an amazing story about Nari. It must have been so exciting. Thanks Anna, I couldn’t believe our lucky getting Nari come in to feed from us. Of course any dolphin would have been incredible but he is extra special. I am sooooo envious and all I have done is look at your fabulous photos. Tomorrow I will actually read your post!